friday night celebrated an event that has been over 10yrs in the making, and i am so incredibly proud of my husband. he and his fellow colleagues work so hard to make this a night to remember, staying up till 3am most nights for the past few weeks. 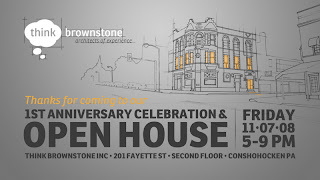 we had our friends and family, clients and potentials, come out and open up brownstone. dj dan fisher did an amazing job creating a sweet atmosphere, and the food was outstanding. once again, i'm so happy and proud of brian.... this is a dream come true.